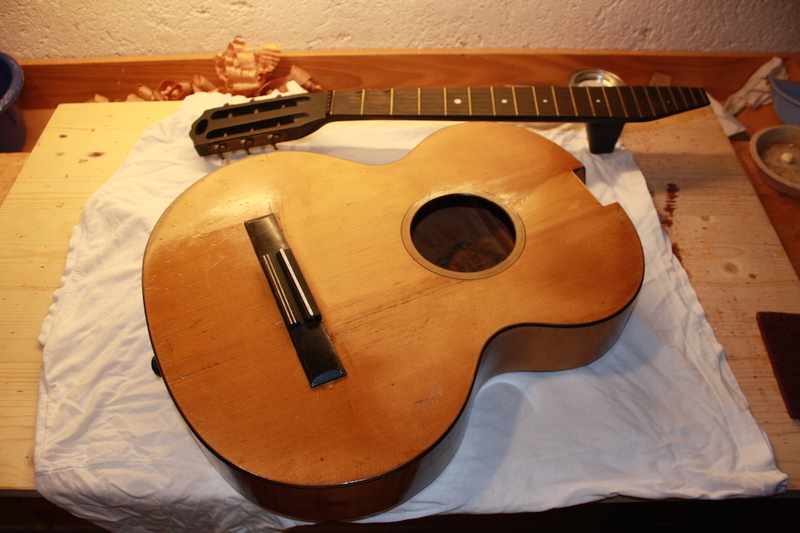 I had the great honor to restore a wonderful guitar of Herrmann Hauser the 1st. It was a Vienna Model from 1920, that was in quite good condition basically. But anyhow, there were some damages that affected the structure and that needed to be fixed in order to secure the instrument for a long future. In an earlier “repair” the original bridge was lost and replaced by an industrially manufactured piece. The original schellac was overpainted by a thick layer of another paint based on schellac and the guitar was coverd all over with black spots, which may have come from someone painting the black neck. The neck was broken several times, the back had a crack and has lost connection on several places with the sides. So the goal was to secure the instrument and protect it against further damage and on the other side to take away the incredible remarks of those earlier “repairs” in order to bring it back into its original condition. As the grand-aunt of the owner had playd this guitar for her entire lifetime, I was asked to keep her traces on the guitar as a reminder on her.